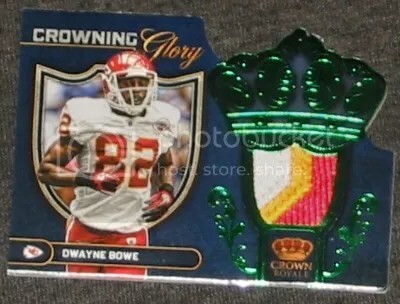 Congrats to Hockeyisboss on being the lucky winner of the Dwayne Bowe 2012 Crown Royale – Crowing Glory 3-Color Patch #’ed/49. Once Hockeyisboss sends me their mailing address, I will ship this card ASAP. Thanks! Crown Royale is one of the most overly designed products out on the market. Each card seems to be going in about a million different directions. 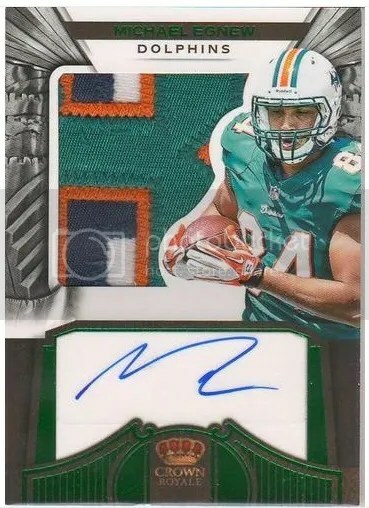 I don’t mind the die-cut design, in fact I prefer it, but there is just too much going on. 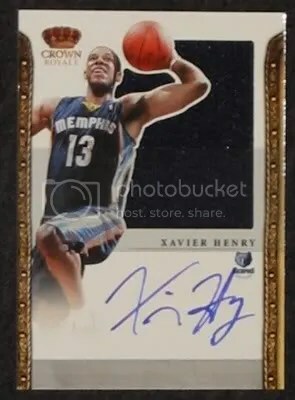 The silhouette cards this year don’t look as nice as the ones from 2011. They feature white boxes and some of them have sticker autographs. 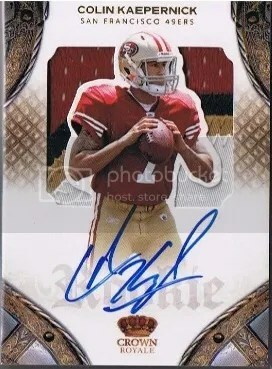 The 2011 silhouette cards don’t have an encased autographed. I believe these look a lot better. I’m all for anything die-cut. When I first saw these I thought someone had taken a bite out of it. Boxes are currently selling for $100.00. Inside each box you should find at least (4) “hits”. 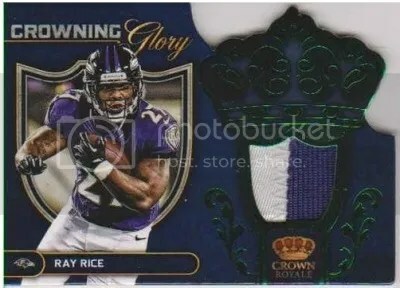 Overall, I give 2012 Crown Royale Football a very generous 3 crowns out of 5 (1=poor & 5=perfect). My main beef I have with it is the overly complicated design. The silhouette cards were designed much better last year. 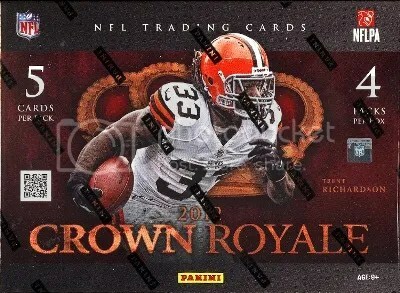 The Crown Royale brand was a major part of Pacific when they produced cards. Pacific made a lot of popular inserts back in the 90’s. 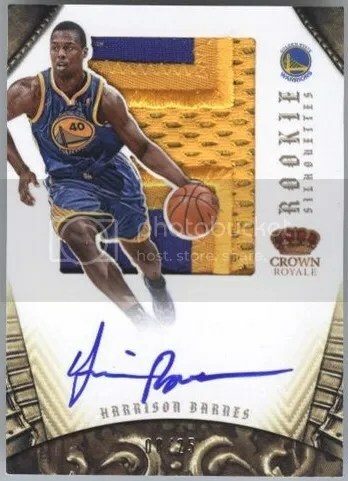 I’d like to see Panini use the Crown Royale brand as a launching pad to bring some of those inserts back. Congrats to Michael C on being the lucky winner of the Curtis Joseph 11-12 Crown Royale Mythology Jersey. Once Michael C sends me his mailing address, I will ship this card ASAP. Thanks! 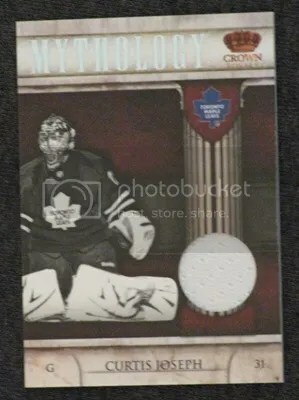 This contest will be for a Curtis Joseph 11-12 Crown Royale Mythology Jersey. Good luck!! !